How long does it take for unbridled joy and optimism to dissolve into utter disbelief and then despair? A half inning, apparently. A stunning four-run ninth inning by the defending World Series Champion St. Louis Cardinals turned a raucous Nats Park into a mausoleum as quickly as that as the Cardinals came back from two runs down and snatched victory from the jaws of defeat in a period of three outs, beating the Washington Nationals 9-7 and winning the best-of-five series, three games to two, to advance to the National League Championship Series. 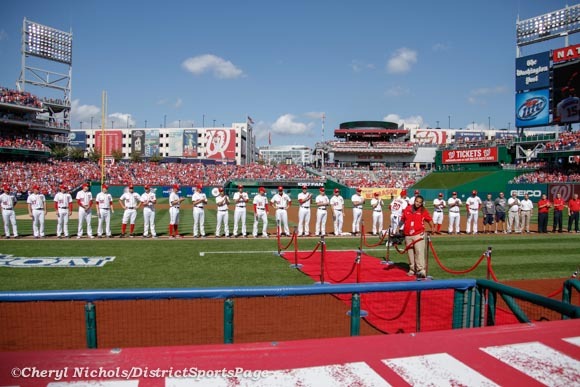 The Washington Nationals hosted their first playoff game ever at Nationals Park. 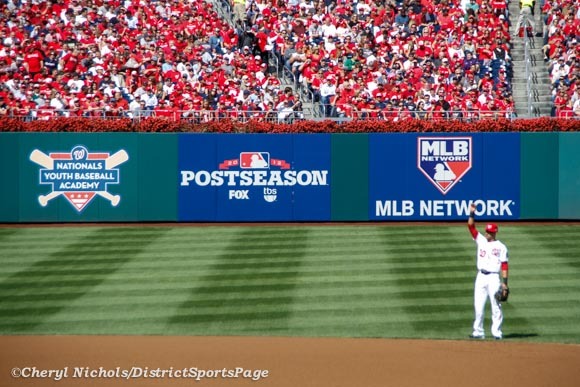 The St. Louis Cardinals defeated the Washington Nationals 8-0 in game three of the NLDS on Wednesday, October 10, 2012. In a nutshell: It was a picture perfect day for baseball, however, the game did match the weather. 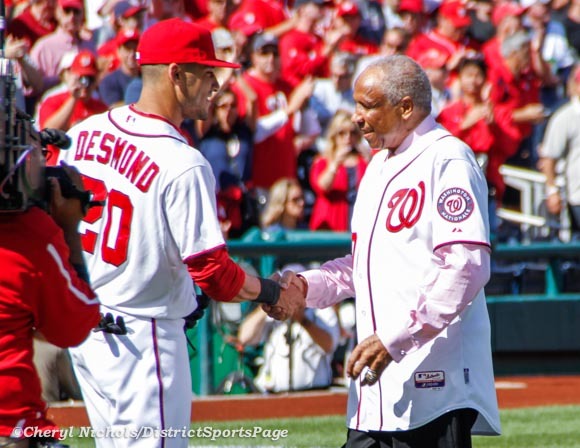 Former Nationals Manager Frank Robinson threw out the ceremonial first pitch. You can read DSP’s game re-cap for details. 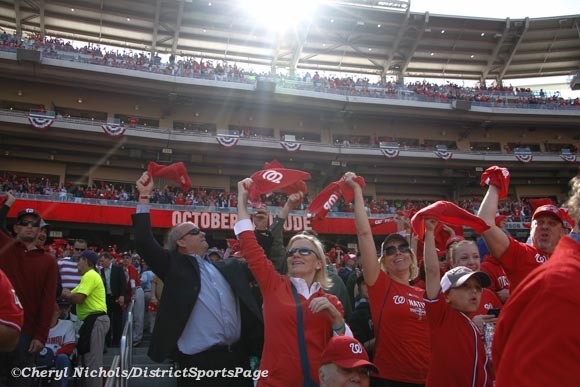 Here are a few photos of Wednesday’s NLDS home game one with descriptions under pictures. All photos were taken from the stands. Enjoy and feel free to leave comments! Thanks. In the first MLB playoff game in Washington D.C. since 1933, things certainly did not go as planned for the home team. 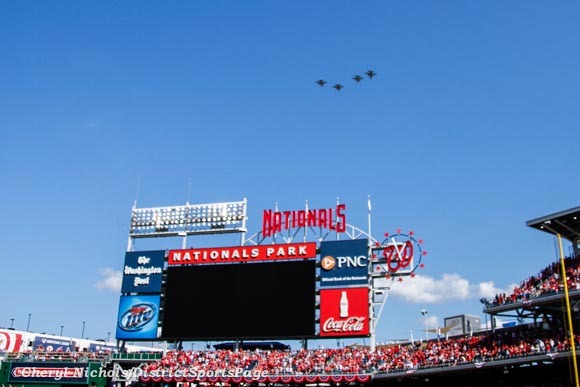 The scene was all set: a sellout crowd decked out in red, a ceremonial first pitch by the still-beloved first manager of the team after the move to the District, and a flyover by a quartet of F-16s. 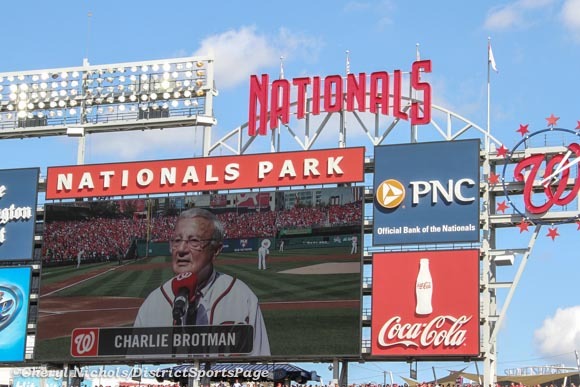 Unfortunately, the Washington Nationals that took the field could not complete the day, as for the second game in a row the St. Louis Cardinals dominated every facet of the game, beating the Nats 8-0, to take a 2-1 lead in the best-of-five National League Division Series. 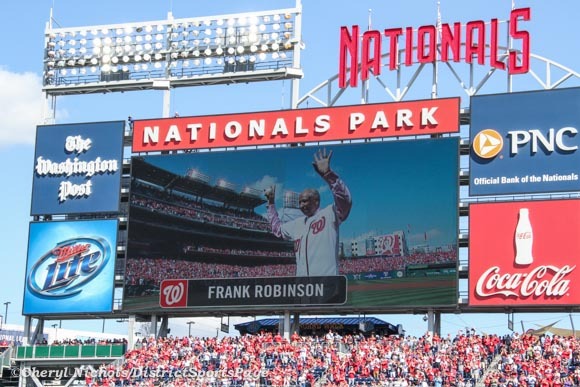 As it turns out, the highlight of the day for the Nats was former manager Frank Robinson throwing out the ceremonial first pitch of the game, finally getting his curtain call from the organization that he meant so much to, first in Montreal, then in the first two seasons after the move to the District in 2005. As for the play on the field, well, there wasn’t a whole lot to talk about. 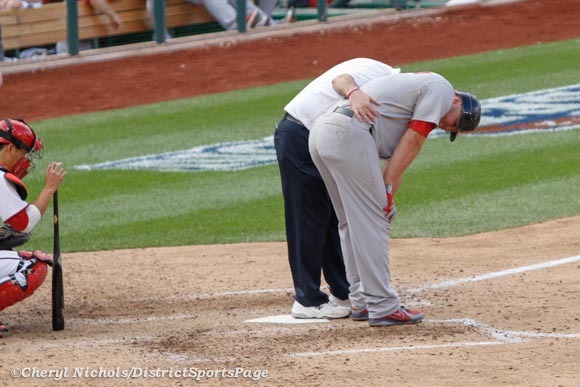 The Nats managed to play a cleaner game than the mess that was Game 2 in St. Louis, but the result was quite the same. 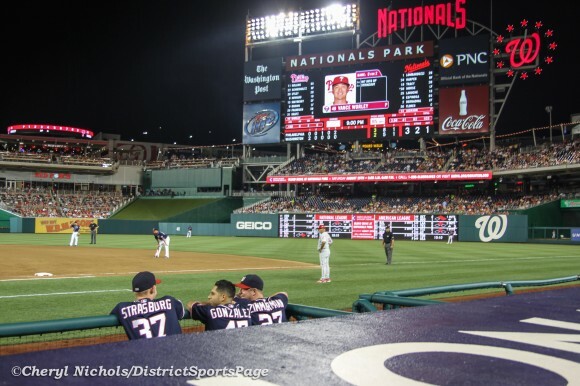 Starter Edwin Jackson gave up four runs in the second inning, Craig Stammen and Ryan Mattheus provided little relief, and the Nats hitters stayed dormant with runners in scoring position. Jackson calmed down after giving up four in the second, but the Nats bats just couldn’t help him out at all. In total, the righty allowed eight hits and one walk, striking out four in five innings. The most damaging blow against Jackson was a three-run home run by No. 8 hitter Pete Kozma, who’s hit two home runs in 89 MLB at bats over two seasons. But the Nats stranded 10 runners through the sixth inning and didn’t have another one reach after that point until Jayson Werth’s walk with two outs in the ninth. 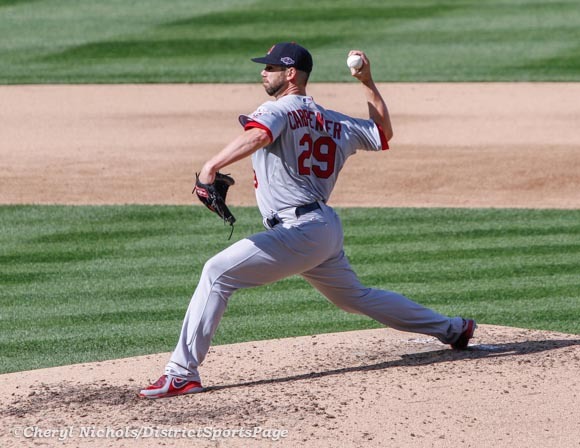 Cardinals starter Chris Carpenter got the win, going 5 2/3 inning of shut out ball, allowing seven hits and two walks, striking out two. 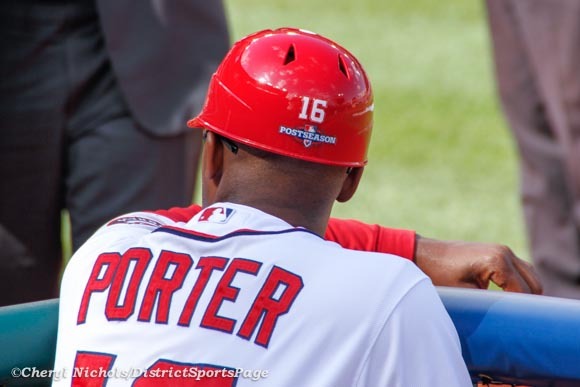 We’ll have more coverage of the Nats 8-0 loss later at District Sports Page. Dave Nichols is Editor-in-Chief of District Sports Page. He is credentialed to cover the Nats and the Caps, and previously wrote Nats News Network and Caps News Network. Dave’s first sports hero was Bobby Dandridge. Follow Dave’s Nationals coverage on Twitter @NationalsDSP. Popular Internet meme, created by @JWerthsBeard and @jackobeam. 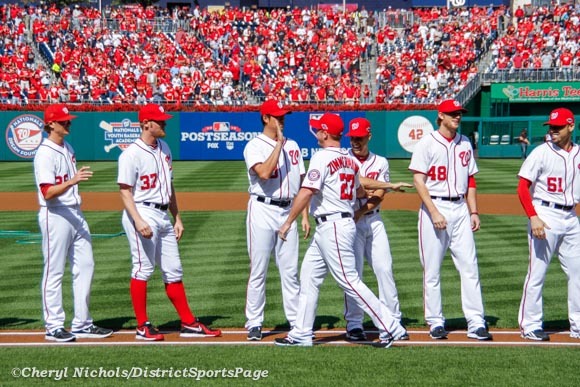 All season long, the Washington Nationals have boasted not only of the quality of their starting pitching, but of the depth as well. In Games 3 and 4 of the National League Division Series, they’ll get a chance to prove just that. With ace Stephen Strasburg available solely as a cheerleader and confidante in the playoffs, the Nats post-season success now lies in the right arm of Edwin Jackson and left arm of Ross Detwiler. Both players have impressive enough pedigrees. Jackson has a no-hitter and World Series ring to his credit. Detwiler is a former No. 6 overall pick in the MLB draft. 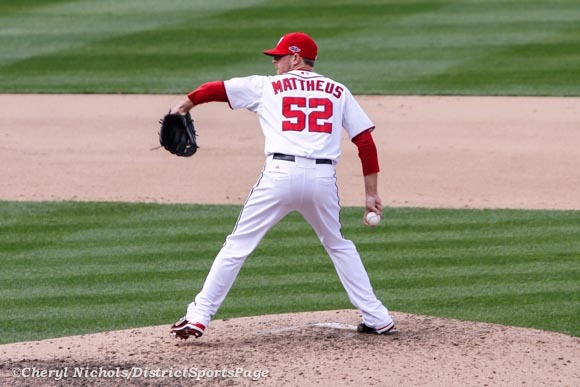 Both players have established themselves as key components in the Nats rotation this season. But both have also had enough trouble — especially lately and especially against today and Thursday’s opponents — that there is reason to be concerned about how they will react and perform against the St. Louis Cardinals, with the Nats hopes of advancing in the playoffs hinging on their performances. This is a big start for Jackson, both in his responsibility to the Nationals and for his immediate and long-term future. He spurned a multi-year deal last off-season to sign with the Nats for just one year, with the very hope that a strong season and successful post-season appearance would earn the 29-year old a lucrative, multi-year deal that will set him up for the rest of his career. Jackson fulfilled the first part of the equation, going 10-11 with a 4.03 ERA, 1.218 WHIP, 8.0 K/9 and 2.8 BB/9 in 2012. Wednesday’s start could complete his resume for his off-season pursuit of happiness. Detwiler, the 2007 No. 6 overall selection in the MLB Amateur Draft, has finally started to live up to his pedigree. Stunted thus far in his career by injury and inconsistency, both due to an overly pronounced cross-body delivery, Detwiler has been proving critics wrong all season. He still has an unattractive delivery, but it is much smoother and consistent, allowing his heavy sinker to do much of the damage against opposing batters, allowing the 26-year old to put together an impressive 10-8 season with a 3.40 ERA and 1.223 WHIP. It’s the biggest start of Detwiler’s young career, but in his media availability Wednesday before Game 3, he joked about how his last start against the Cardinals, a 2 1/3 inning appearance where he allowed seven runs (three earned) on four hits and five walks, was an example of “what not to do,” against a Cardinals team that has power and puts the ball in play, from the leadoff hitter down to the No. 8 spot. Jackson and Detwiler have both had dominant appearances in 2012, but they also have had their share of disaster starts as well. The Nationals have exhibited confidence in both starters all season long. They’ve even banded together to form “The Other Guys”, a reference to how the two may have been overlooked this season with so much attention to the top three on the Nats staff, based on the Hollywood movie of the same name and a now a popular Internet meme. But all the attention on Stephen Strasburg, 21-game winner Gio Gonzalez, and Jordan Zimmermann doesn’t matter at all anymore. 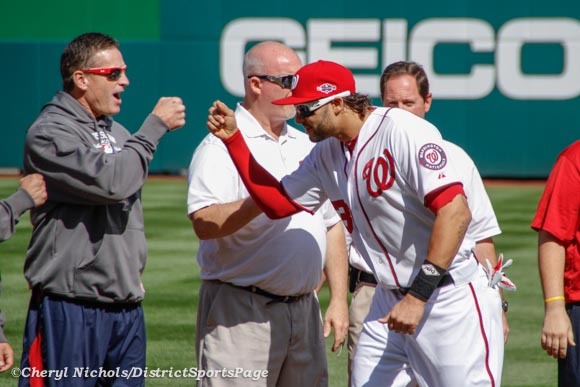 The Nats very playoff lives hinge on the performance of “The Other Guys” the next two days. Nats fans hope their performance matches the Nats organization’s confidence in the pair. Our long Nationals nightmare is over. No, not the Washington Nationals clinching MLB’s best record, which they did with a 5-1 win over their bitter rival, the Philadelphia Phillies. No, not the idea that with the best record, and the N.L. 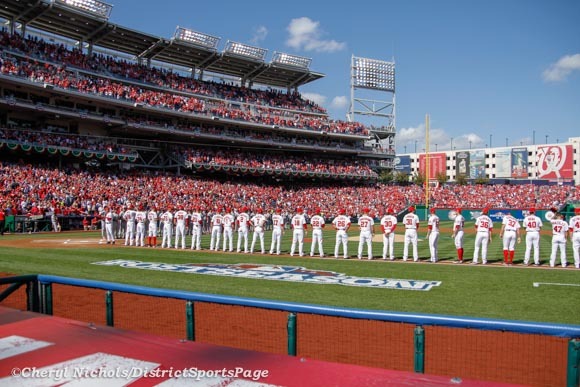 winning the All-Star game, the Nationals would have homefield advantage throughout the playoffs regardless how far they advance. No, it was none of those things actually baseball related: Teddy Roosevelt finally won the President’s Race. 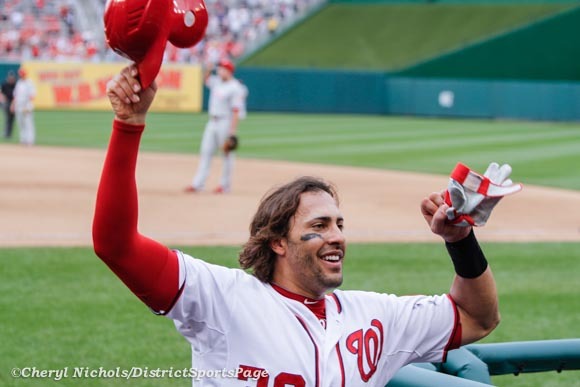 In all seriousness, the Nats benefitted from 6 2/3 solid innings from Edwin Jackson and three home runs — one each from Ryan Zimmerman, Tyler Moore and Michael Morse — to defeat the Phillies Wednesday afternoon, finishing the 2012 regular season with an MLB-best 98-64 record. 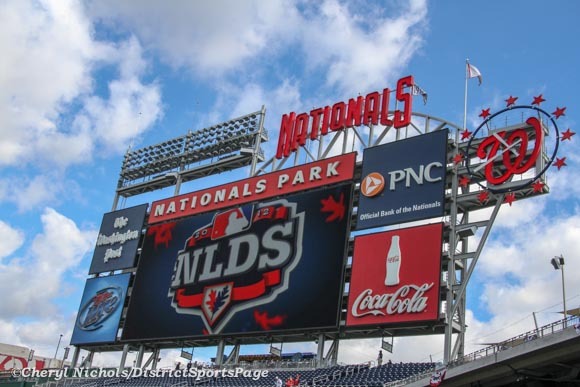 The Nats will open post-season play in the League Division Series against the winner of the wild-card play-in game between the Atlanta Braves and St. Louis Cardinals, to be played Friday evening. The biggest development might have been that manager Davey Johnson revealed after the game that he spent the last couple of innings in the clubhouse, receiving x-rays and treatment from team doctors after he experienced numbness in his left leg, due to nerve irritation in his back. Johnson said he was okay after the game and more concerned that he would take a misstep than anything else, and team doctors prescribed him anti-inflammatories and pain-killers. Bench coach Randy Knorr handled managing duties for Johnson in the late innings. As for the game action, the Phillies actually scored first, scratching a run in the top of the fourth against Jackson (W, 10-11, 4.03). Carlos Ruiz doubled to lead off the inning, took third on a ground out, and came home on rookie Darin Ruf’s sacrifice fly to center field. It’s all the Phillies would get off Jackson, as he was as effective today as he’s been all season. For the day, the soon-to-be free agent right-hander gave up just the one run on six hits and a walk, striking out six. The Nationals got that run back — and more — in the bottom half of the inning against Phillies starter Cliff Lee (L, 6-9, 3.16). Zimmerman lead off the frame with his 25th home run of the season. Morse followed with a double into the left field corner and scored on Moore’s double right after him to take a 2-1 lead. Washington bolstered that lead in the sixth, when Moore launched his 10th homer of the year 10 rows deep into the bleachers in straight-away left field. The Nats capped the scoring in the eighth inning, as Morse clubbed his 18th of the year to the stands in right center field. After the game, manager Davey Johnson said Morse actually tweaked his left hamstring jogging out the homer and required treatment, but that Morse should be fine for play Sunday. Christian Garcia, Sean Burnett and Michael Gonzalez went 2 1/3 scoreless inning to finish up for Jackson. THE TAKEAWAY: All week long, Davey has said he wasn’t concerned about securing the top spot in the division, but finishing ahead of the Reds means the Nats don’t have to fly all the way across country and face Matt Cain and Madison Bumgarner on the road. Instead, they’ll get either the Cardinals or Braves No. 2 starter, as the two teams face each other Friday evening to decide who moves on to face the Nats. THE GOOD: Edwin Jackson. Even though the Phillies were playing for nothing and fielding a lineup that didn’t include Ryan Howard or Jimmy Rollins, it was important for him to go out and give a good effort after being hit around his last start against the Cardinals. THE BAD: Jesus Flores. He’s seen his playing time significantly diminish since the arrival of Kurt Suzuki, and in his first game in two weeks, the backup catcher went 0-for-4 with three strikeouts to finish the season hitting .213. But instead, they had an imitation — and rather shabbily designed, at that — Philly Fanatic hop over the rail and tackle George, Abe and Tom was perhaps the ridiculously appropriate way to end the thing. Teddy crossed the line ahead of his competition before only to be disqualified, so it’s kinda lame that he got assistance in his first qualified win, but whatever. It’s over, a blogger needs a new gig, and we can all go on with the President’s just being mascots and not some call to arms. THE STATS: 11 hits, 1 BB, 10 Ks. 1-for-10 with RISP, 7 LOB, no GIDP. No errors, no DPs. NEXT GAME: Sunday, Game 1 of the N.L.D.S., location and time to be determined. Coming off Thursday night’s humble celebrations, the playoff-bound Washington Nationals hoped to zero in on the division title, but instead fell victim to the red-hot Milwaukee Brewers in a tough 4-2 loss Friday night. 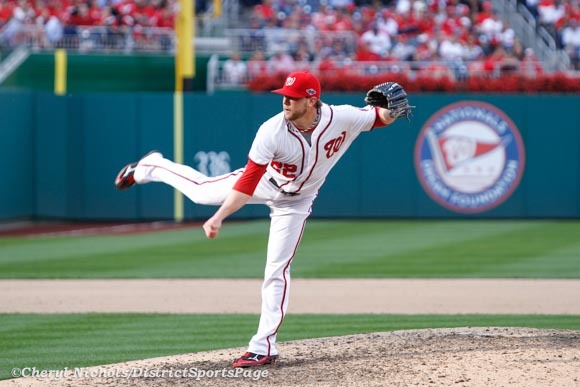 Edwin Jackson (ND, 9-10, 3.77), in search of his 10th win of the season, outpitched Milwaukee right-hander Shaun Marcum (ND, 5-4, 3.86), but another blown save by Tyler Clippard (L, 2-6, 3.46) cost the Nats their opportunity to trim their Magic Number for the division down to six. As if they were riding momentum from last night’s win, the Nats wasted no time putting runs on the board against one of five teams in the thick of the NL Wild Card chase. 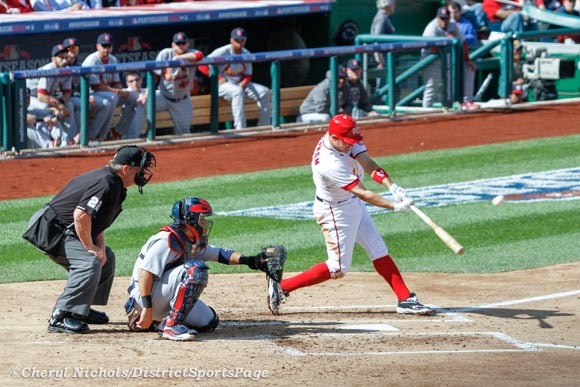 With two outs in the first inning, Ryan Zimmerman singled up the middle and Adam LaRoche belted a two-run homer to left center, giving the Nats an early 2-0 lead. Unfortunately for Washington, however, Jonathan Lucroy took advantage of a hanging breaking ball by Jackson in the top half of the next inning and rocketed a solo shot so deep into the left-field seats it nearly reached the concourse. Despite early bombs by both teams, the night was less a slugfest, but a pitcher’s duel. After center fielder Carlos Gomez robbed Ian Desmond of an extra-base hit with a highlight-worthy diving catch in the second, the Nats’ bats went quiet as Marcum settled in. In fact, aside from Edwin Jackson’s single in the third and Michael Morse’s in the fourth, the Nats did not have a runner on base again until the eighth. Jackson found his own groove, but not before stellar defense in the fourth would save him from a jam. Following a double by Ryan Braun to straight-away center, Aramis Ramirez singled to Bryce Harper and Brewers third base coach Ed Sedar waved Braun on home to try for the tying run. However, Harper quickly chased down the ball in time to launch a perfect throw home to gun down Braun and salvage the Nationals’ 2-1 lead. The Brewers continued to threaten, however, as Jonathan Lucroy grounded safely to Harper to leave runners at the corners with one out. Luckily for Jackson, the Nationals’ infield came to the rescue with a spectacular 4-6-3 double play to end the top of the fourth. After, the Brewers’ bats would remain quiet… that is, until Tyler Clippard came on for the save. Norichika Aoki led off the inning by laying down a perfect bunt just left of the batter’s box in fair territory. Zimmerman raced in to make the play but Aoki beat it out before he could attempt the throw. Aoki advanced to second on a passed ball by Jesus Flores and Rickie Weeks’s sacrifice fly to deep center left Aoki at third with one out. Braun, who went 3-for-4 with two doubles on the night, singled to tie the game and quickly stole second in time to score on Ramirez’s double to the left-field corner. Lucroy lined out to left, but Travis Ishikawa reached first on a tough play by Desmond that allowed Ramirez to score. The play was originally ruled a throwing error, but the officials later credited Ishikawa with the hit, tacking on another earned run against Clippard before night’s end. Craig Stammen came on to relieve Clippard and quickly struck out Gomez to end the inning, but the damage was already done and the Nats fell 4-2. THE TAKE-AWAY: Once again, despite a fantastic effort by Edwin Jackson to become the fifth Nationals pitcher with double-digit wins this season, Tyler Clippard failed to secure the save for the win. 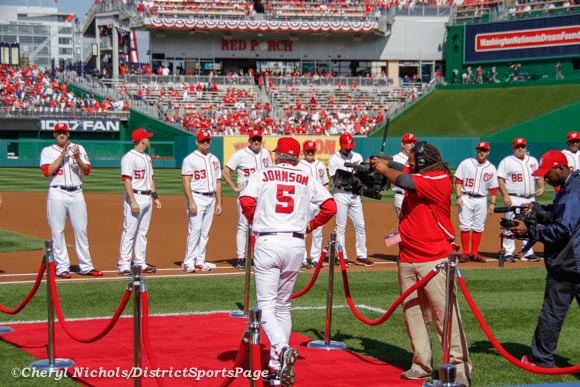 With Clippard and right-hander Drew Storen potentialy splitting the Nats’ closer role, it will be interesting to see how Clippard’s fifth blown save this season will influence Davey Johnson’s decisions as Washington looks to secure the division. THE GOOD: Edwin Jackson shined Friday night, allowing just six hits and one run in eight innings of play. Following the home run to Jonathan Lucroy, Jackson retired the next six batters and with help from Bryce Harper and the Nats’ infield, he pitched into—and out of—only one jam all night. The Nationals defense was superb. 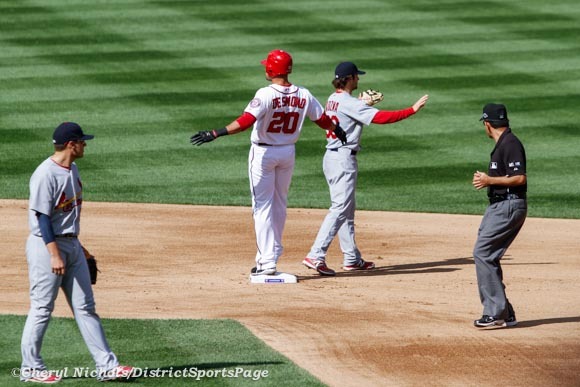 Bryce Harper, once again, demonstrated why third base coaches should think twice about sending runners home when the ball lands in his territory. 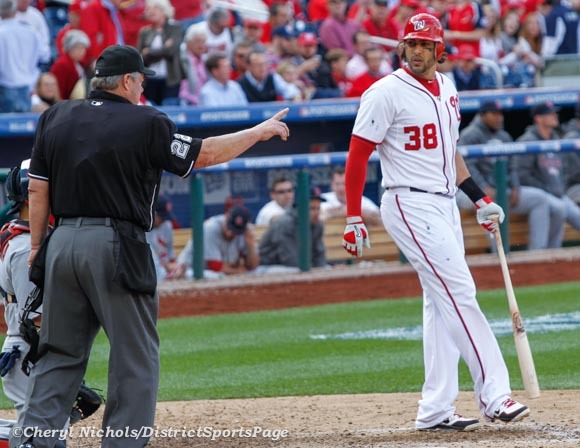 THE BAD: The Nationals’ bats were relatively quiet all night. They managed only five hits and two runs and tallied six strikeouts before the end of the night. 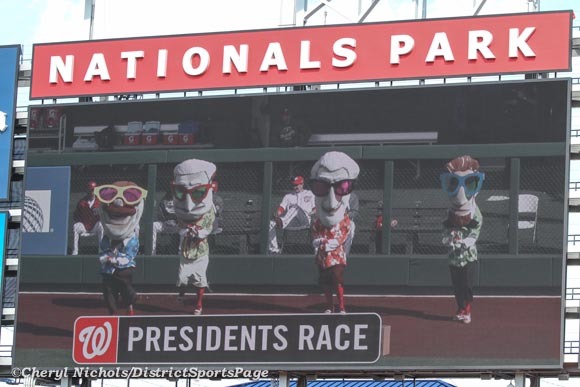 For Nationals fans who speculated that the “Teddy Conspiracy” would come to an end after the Nationals’ clinched the division, it’s time to come up with a new theory. Yet again, the 26th President lost to George Washington. THE UGLY: Moreso than in the regular season, closers play a vital role in the playoffs. If the Nationals’ bats stay quiet, Washington could run in trouble if it can’t rely on Tyler Clippard to produce big outs. It might be time to reconsider how—or if—the Nationals should continue to split the closer role between Clippard and Storen. There are 49 pitchers that qualify for the N.L. ERA title this season. Among those 49 pitchers are five Washington Nationals, and they all rank in the top 24 in WAR (according to Baseball-Reference.com) in that group. Sure, WAR isn’t the end-all when talking about a pitcher’s contribution to his team, but it gives us a starting point to be able to look at the pool of candidates as a whole. It’s pretty impressive that the entire Nats’ rotation ranks that high for a couple of reasons, and it perfectly illustrates why the Nats hold a 6 1/2 game lead in the division with about 20 games left in the season. 1) Health. Other than Chien-Ming Wang, no Nats starter has missed a game due to injury, pending “The Shut Down”. I can’t stress how unusual that is. The Nats have five qualifiers for the ERA title. Only Cincinnati and San Francisco can share that claim this season. Only St. Louis and L.A. have four starters that qualify. Notice a common trend among those five teams? All are first or second in their division and all either occupy a playoff spot today or are within one game of the Wild Card. These are the best teams in the N.L. 2) Youth. All five starters are in the younger half of the bracket, with only Edwin Jackson outside the youngest 14 in the league that qualify. 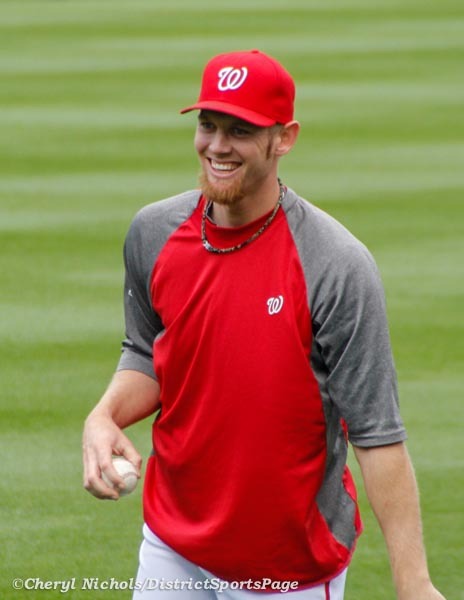 Stephen Strasburg, 23, is the second youngest among qualifiers (Madison Bumgarner). 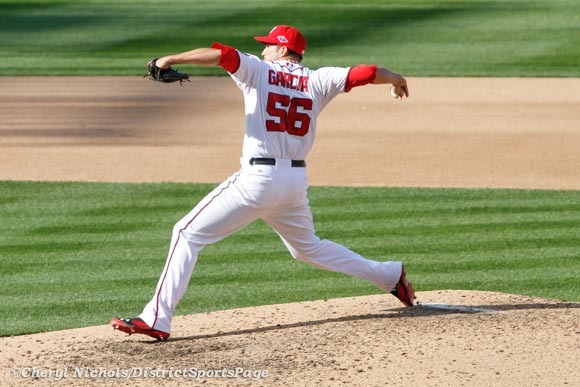 Gio Gonzalez, Jordan Zimmermann and Ross Detwiler are all in their age 26 seasons. 3) Quality. Based on WAR, Edwin Jackson is the least valuable Nats starter. He’s 24th out of 49 qualifiers in the N.L. But he’s the fifth Nats starter to qualify. Gio is fourth overall, Zimmermann is eighth, Strasburg is 14th and Detwiler is 21st. Cincy and San Fran have multiple starters each in the lower third of the candidates (including Tim Lincecum, last among N.L. ERA qualifiers in WAR). All five Nats are also in the top 20 in OPS+, with only Jackson outside the top 12. This tells us the Nats starters as a whole excel at keeping runners off base and not giving up extra base hits. That’s good. Davey cites the oldest of old-school stats ever in backing his pitcher for the Cy Young. That’s okay, he’s 69 years old. But even he knows better. He knows that the voting members in the BBWAA still cling to the notion that starting pitchers are supposed to win games for winning teams, when in reality it’s their job to make outs and pitch deep into games. Dickey has one fewer win than Gio going into Tuesday night’s game, so isn’t it more impressive he’s pitched well enough and deep enough that he’s qualified for all those wins on a losing team? 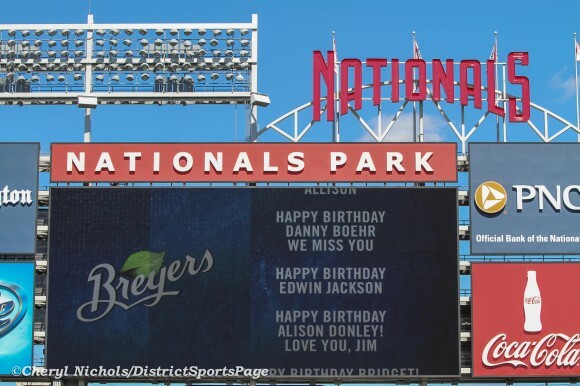 The point of this wasn’t to tear down R.A. Dickey, or to boost the qualifications of any of the Nats individual pitchers. Rather, it was to illustrate just how good the Nats rotation has been in total. Sure, Strasburg, Gonzalez and Zimmermann will garner votes for the Cy Young Award, and rightly so — regardless the criteria the individuals on the voting committee employ. 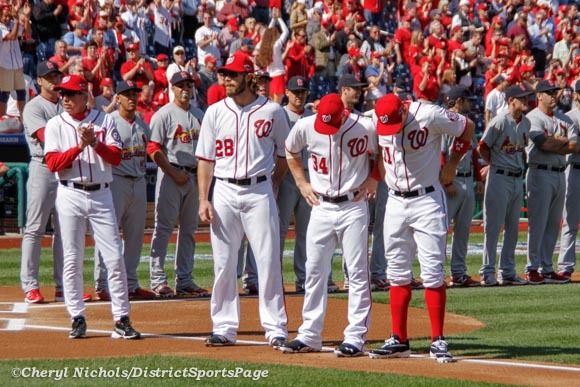 But as a group, there hasn’t been a better starting staff top-to-bottom than the Nats. I’ll take that over essentially meaningless awards any day. HAPPY 29th BIRTHDAY EDWIN JACKSON! 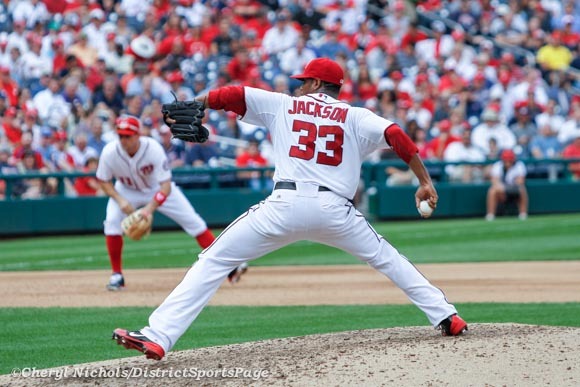 Washington Nationals RHP Edwin Jackson was born on 09/09/1983 in Neu-Ulm, Germany. Happy Birthday #33! Send EJax a birthday greeting via his Twitter account. 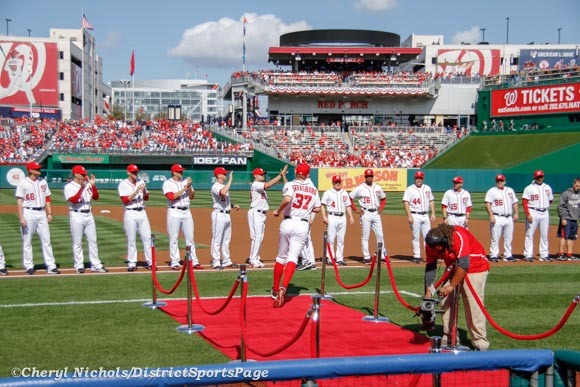 It was in the not-so-distant past when the Washington Nationals trotted out non-prospect rookie after rookie in meaningless September games, watching their opponents abuse their unprepared pitchers one after the other. 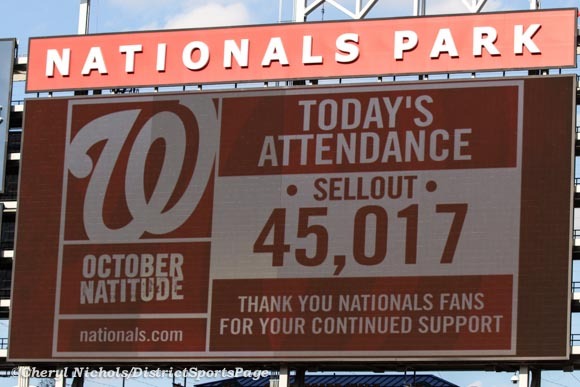 Tuesday night, it was the Nats’ turn. The first-place Nats scored in every inning but two against seven different rookie pitchers for the Chicago Cubs en route to an 11-5 victory before a meager crowd of just 17,648 at Nats Park. The win, coupled with a loss by the Atlanta Braves, stretches the Nats (83-52) lead in the N.L. East to 7 1/2 games. 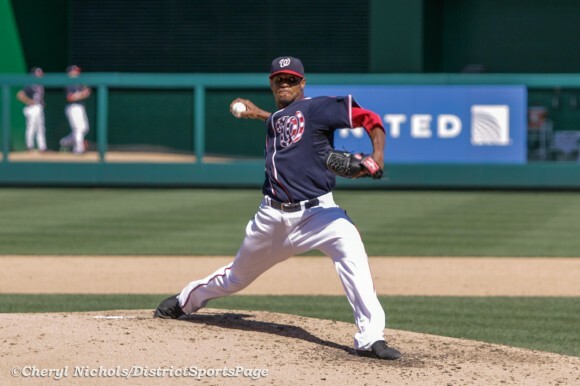 Edwin Jackson earned the win, despite running out of gas abruptly in the sixth inning. The right-hander had allowed just one run through five innings, but gave up a three-spot before being lifted with two outs in the sixth. The Nats lead was so large by that point though that Jackson easily qualified for the win, his ninth of the season. In total he allowed four earned runs on seven hits and one walk, striking out eight. The Nats jumped all over Cubs starter Chris Rusin, making his second MLB appearance, right off the bat. 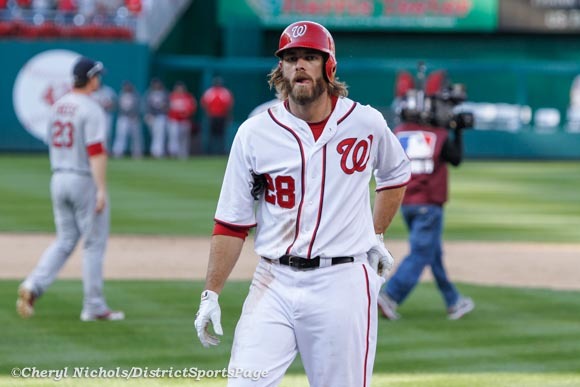 Jayson Werth singled to lead off the bottom of the first and Ian Desmond launched his 20th homer of the season into the right center bleachers just three pitches later. Rusin got out of the rest of the inning escaping further damage, but the Nats picked up where they left off in the second. Jesus Flores led off with his fifth homer of the year, sending one into the seats on the Red Porch. Jackson followed with a line drive single over the shortstop’s head. 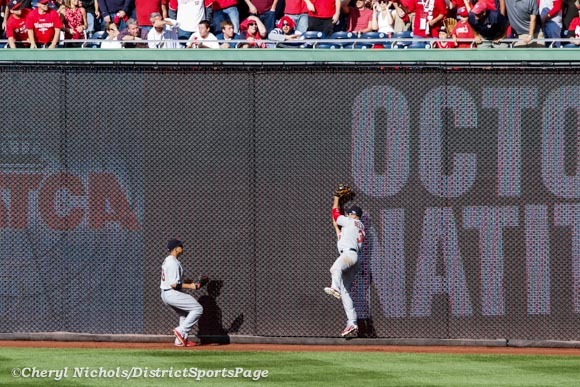 Werth lashed a double into the left field corner and Desmond scored them both with a double of his own to left center that fell just a few feet from being his second homer of the game. The Cubs got a run in the fourth on Starlin Castro’s RBIs single, but the onslaught continued for the Nats in the bottom half against Rafael Dolis, the Cubs’ fourth pitcher in as many innings. With two outs, Adam LaRoche sent one into the Cubs bullpen for his 26th homer of the season, and third in three days. Espinosa singled, then Tyler Moore launched a moonshot that fell 15 rows back in the left field stands to make it 8-1. 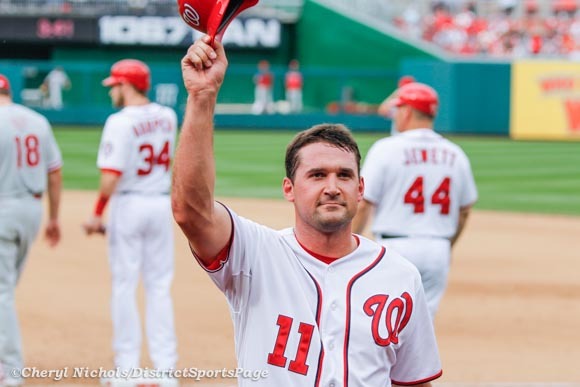 Ryan Zimmerman was the last Nats starter to record a base hit. That came in the sixth in the form of his 18th home run of the season. The Nats tacked on their tenth run in the seventh. Bryce Harper, who came in for defense the previous inning, doubled, took third on a wild pitch, and scored on Werth’s fourth base hit of the night. LaRoche had one more swing in him as well, taking one to deep right field in eighth inning for his second home run of the night and his 27th of the season, capping the Nats scoring for the evening. The six home runs tied the record for the most hit by the Nats in team history since the relocation in 2005 (vs. the Orioles, May 20, 2011) and was the most a Washington-based team has ever hit at home in history. THE TAKEAWAY: Everyone got in on the act last night. Every Nats position player that batted got a hit — even Jackson went 2-for-3. It was an impressive display against a bunch of pitchers that might not be in Major League uniforms for very long. LaRoche has hit four homers in four days. 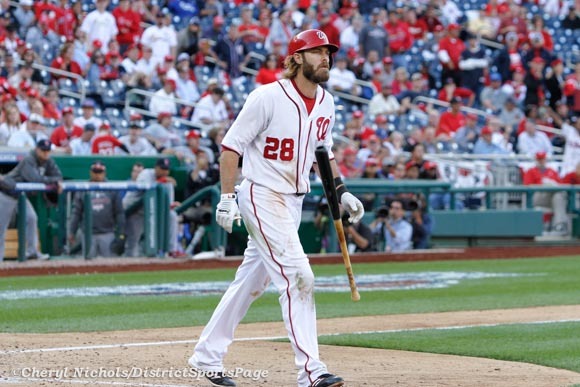 Werth is hitting .346/.419/.490 since returning from his broken wrist, mostly from the leadoff spot. Desmond matched a career high for single-game RBIs — in the second inning. 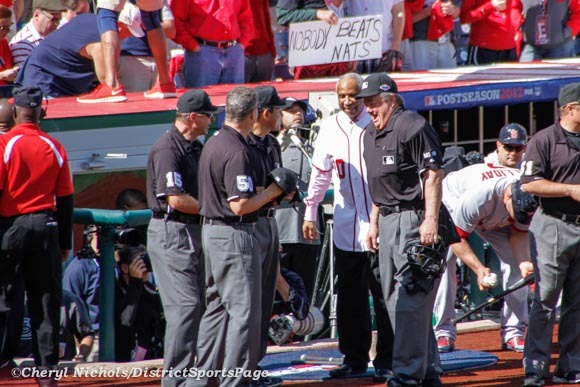 Other than a couple tense moments by Tom Gorzelanny in the seventh inning, this one was a laugher. THE GOOD: LOTS to go around. Werth was 4-for-5. Desmond was 2-for-4 with four RBIs. LaRoche was 4-for-4 with two solo homers. Espinosa was 2-for-4. Moore’s homer was a moonshot and Flores’ was a laser. Just good stuff all around. THE BAD: Ryan Mattheus gave up a solo home run to Alfonso Soriano in the eighth inning. THE UGLY: Tom Gorzelanny. He walked the bases loaded with the score at 9-4 to bring up Anthony Rizzo, the Cubs best hitter. It was a tense at bat, with Gorzy finally striking out the rookie, but it was enough to get the heart rate up a bit. THE STATS: 19 hits, 2 BBs, 8 Ks. 3-for-11 with RISP, 9 LOB, no GIDPs. No errors, 1 DP. NEXT GAME: Wednesday at 7:05 against the Cubs. Gio Gonzalez (17-7, 3.10) hosts Chris Volstad (2-9, 6.06). Also, it’s Dollar Dog Night, if you’re in to that sort of thing. NATS NOTES: Christian Garcia made his Major League debut in the sixth inning, getting a pop up to end the inning after Jackson allowed the three runs in the frame. Garcia, 27, was a 2004 draft pick of the New York Yankees and has had two Tommy John surgeries on his pitching elbow. BATTING SONGS: We put together a list of this season’s music. Check it out and help us keep it updated. Thanks. Okay, maybe it’s not proper to joke about the Washington Nationals shutting down their ace pitcher once he reaches his innings limit. But if the alternative is more starts like last night’s from Edwin Jackson, then pass the Kool-Aid. 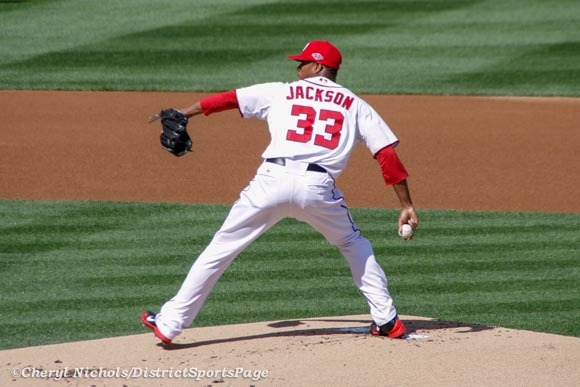 Jackson, pitching against the team that he helped earn World Series rings for last season, was masterful, striking out 10 in eight innings — allowing just one unearned run — leading the Nats to an 8-1 win over the St. Louis Cardinals in the teams’ first meeting of 2012, before 23,269 at Nationals Park.